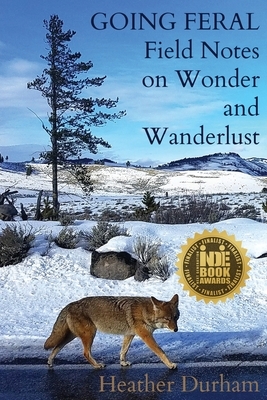 In these deeply personal and intellectually curious essays, Heather Durham explores wild America weaving the unique perspectives of trained ecologist, inquisitive philosopher, and restless nomad, probing intricacies of the natural world as profoundly as she does herself. She wanders from New England vernal pools to Pacific Northwest salmon runs, Rocky Mountain pine forests to Desert Southwest sage flats in search of adventure, solace, authenticity, and belonging in the more-than-human world. Part scientifically-informed nature writing, part soul-searching memoir, Going Feral is the story of a human animal learning to belong to the earth. As one way to be the restoration architects of Eden, we can kindle a saving kinship with earth through the kind of sensory immersion, and resulting engine of discovery, described evocatively by Heather Durham's Going Feral. To go into the wild like this requires a kind of rich hurt that teaches viscerally, and Durham takes the reader through accounts of deep engagement that pay dividends in awareness, curiosity, and wisdom. She's not afraid to be afraid, not timid about the threshold to true encounter, and we are lucky for that. Read this book as a field guide to building your own agenda for going feral for moments of insight, and a life of change. "Is this loneliness for people, or for earth?" To answer, Going Feral sets out on a quest conveyed in many small epics. These are the essays kicked up by a rowdy wanderlust. . . but also won in quietness and long attentiveness to the natural world. Durham might find that she belongs in forests or in deserts, on mountain peaks waiting for raptors, or in ferny, rooty hemlock hideouts. The payoff: She sees things. Dragonfly. Butterfly. Bunny-eared bat, bison hanging out in rural restrooms, a decapitated Bambi, and more cougars than anyone has a right to. "Who am I now? "she wonders, captivated. A reader could be stirred up here, could be reminded to wander a little (or a lot), could be inspired to shut up and hunker down and let the awkward perfection of the wild reveal itself. Something like hope could appear. Something like spirit. Heather Durham is a nature essayist and naturalist who holds a Master of Science in Environmental Biology from Antioch New England University and a Master of Fine Arts from the Northwest Institute of Literary Arts. She currently lives and writes in a feral river valley northeast of Seattle where she serves as an administrator at Wilderness Awareness School. Her essays have been published in a variety of literary journals; Going Feral is her first book.